Ruby is a daughter of our Master Hunter/Master National Finalist, Merganser's Hacker MH, WC, CGC. Ruby was purchased by Merganser Kennels in August 2007. Ruby achieved her Junior Hunter title in September 2009. Ruby received an International Show title and a Canine Good Citizens Certificate in April of 2009. 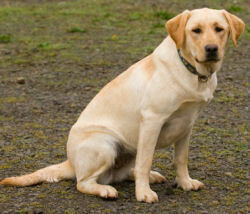 Ruby achieved her Working Certificate hunting title and a Conformation Certificate at the Labrador Retriever Club National Specialty in October 2007. Ruby weighs 73 pounds. Ruby has nice conformation, is athletic, has lots of drive in the field, is outgoing, and a very sociable house dog. The main reason I was able to purchase Ruby was because she had a passion for killing free range chickens. Ruby's pedigree is the best of field and show. Warden Abbigail's pedigree (Ruby's dam) goes back to the old Labrador lines of CH Receiver Of Cranspire, CH Valleywood's One Man Band, CH Tabatha's Remarque O Citadel JH, CH Brooklands Hampshire Bucky, CH Sandylands Rip Van Winkle, CH Lochiel Kresland Geordie Boy CD, and CH Sailin' Cajun's Casanova CD. Daniel Beck (Abbigail's owner) uses her to assist with drug detection and finding illegal poachers. Daniel is employed by the California Department of Fish and Wildlife. Ruby has been spayed and is living a life of leisure as a full time house dog with Marie Buscemi MD in Eugene. Ruby's lines continue in our breeding program with her daughters Int CH Merganser's Pearly Gates and Int CH Merganser's Opal.